NEWCASTLE: Thursday, November 29, 2018: CLASSY colt Graff will not be a Magic Millions contender at the Gold Coast on January 12. Kris Lees moved swiftly today to advise punters that his young sprinter would not be pursuing a path toward the $2m 3YO Guineas (1400m) at the Millions meeting. TAB.com.au opened early betting on the Guineas and installed Graff as one of three joint $8 favourites, and was later taken out of the market. “Because it’s an all-in market (punters lose their money if a horse doesn’t run), we wanted to advise everyone as soon as we became aware betting had opened,” Lees said. “Entries were taken quite a while ago, and I can assure punters Graff is not going to the Gold Coast. 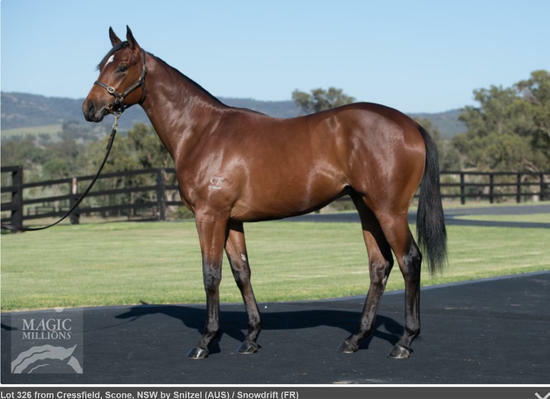 “He is back in light training at our farm at Ellalong and looks terrific. Graff was spelled after finishing an outstanding fifth on a ‘Heavy 9’ to Redzel in the $13m The Everest (1200m) at Royal Randwick on October 13. The lightly-raced Star Witness colt has a 50 per cent win record (three from six starts) and won the Group 3 San Domenico Stakes (1100m) when resuming at Rosehill Gardens in August. He then was placed in both the Group 2 Run To The Rose (1200m) and Group 1 Golden Rose (1400m) in September at the same track. Meanwhile, Lees will have two runners in the race named in his father’s honour at Newcastle on Sunday. He has decided to start the unraced Australian Bloodstock pair Snowzone (Andrew Gibbons) and Vinrose (Glyn Schofield) in the $75,000 Max Lees Classic (900m) for two-year-olds. “They’re both nice youngsters who won trials at home on October 22,” Lees said. Snowzone, a Snitzel colt, won his 800m trial at Newcastle in 48.77 seconds. I am Invincible filly Vinrose won her 800m hitout in 48.78secs. Gibbons rode both horses. Lees also accepted with Tycoon Street (apprentice Louise Day) in the Robert Thompson Benchmark 64 Handicap (1200m) at Sunday’s meeting, but the mare is an unlikely starter.